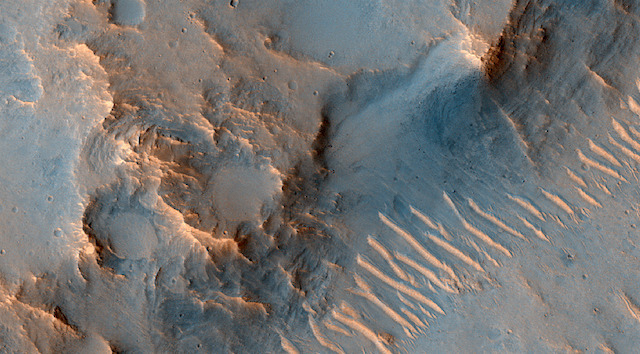 Ejecta margin near Ares Vallis. The objective of this observation is to examine the margin of a crater’s ejecta. The ejecta on this side looks different than on the opposite side. Ares Vallis is an outflow channel, likely carved by fluids in the distant past. This entry was posted in Reports and tagged Ares Vallis, Beautiful Mars, ejecta, High Resolution Imaging Science Experiment, HiRISE, Mars Reconnaissance Orbiter, MRO, NASA, outflow channels, University of Arizona. Bookmark the permalink.